The red squirrel or Eurasian red squirrel is a species of tree squirrel and is a tree-dwelling omnivorous rodent that is common throughout Eurasia, but is no longer common in Britain where numbers have decreased drastically, in part due to the introduction of the grey squirrel from the USA. Until the arrival of the grey squirrel, this species was the only native squirrel in the UK. Sadly, it has been out-competed by the grey and has been lost from much of its former range. Red squirrels' fur ranges from a warm reddish-brown in summer, to deep chocolate brown with grey in winter. The colour may be very variable in any one locality, ranging from almost black to buff. The underside of the squirrel is always white-cream in colour. Red coats are most common in Great Britain, in other parts of Europe and Asia the different coat colours co-exist within populations, much like hair colour in humans. They moult their coat twice a year a thinner summer coat to a thicker darker winter coat between August and November, but their ear tufts only once, in late autumn. Reds have a bushy tail and large ear tufts. They have four fingers and five toes and can be right or left handed, they have sharp curved claws which helps them when climbing of trees, even when branches are overhanging. It is thought that the long tail helps them to balance and steer when jumping from tree to tree and running along branches and may keep the animal warm during sleep. Life span - They live for up to 6 years, average 3 years. Statistics - Head and body length: 18-24cm, Tail length 14-20cm, Weight: 250-350g. Habitat: Red squirrels live in large patches of conifer forest (over 50 hectares), and in the UK, they have adapted to Scots pine forest. They can be found at altitudes up to 2000m in the Alps and Pyrenees. Food: Red squirrels eat spruce and pine seeds, acorns, berries, fungi, bark and sap tissue revealed once they have striped the bark back, storing surplus food either just below the ground or in tree clefts in autumn. Breeding: They mate between January and March, and in summer between June and July and have a litter of 3-4 kittens in each litter, following a gestation period of 36-42 days. If there is a poor cone crop the litter may not be born until the summer. The young are weaned at 7-10 weeks, and are independent at 10-16 weeks. Parental care involves only the female. Females typically start reproducing in her second year, and they must reach a minimum body mass before they are ready, heavier females will produce more offspring. Distribution - Red squirrels are widespread in Europe, but have largely been replaced by the grey squirrel in the southern half of the UK and in local pockets in Italy. They are absent from southern Spain and the Mediterranean islands. Behaviour - Red squirrels live high in tress and in a nest (drey) of approximately 30cm in diameter, which has a frame of twigs and is lined with moss and grass. The drey is usually at least 6m off the ground, and can be a hole in the tree or against a trunk and branches. Each squirrel may use several dreys and they have a home range of seven hectares. They do not hibernate, but will remain in their dreys for several days at a time during bad weather. They can hang upside down. Their active period is in the morning and in the late afternoon and evening. It often rests in its nest in the middle of the day, avoiding the heat and the high visibility to birds of prey that are dangerous during these hours. During the winter, this mid-day rest is often much more brief, or absent entirely, although harsh weather may cause the animal to stay in its nest for up to days at a time. The red squirrel is a solitary animal and is shy and reluctant to share food with others. 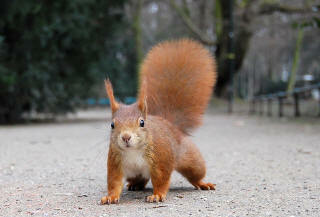 However, outside the breeding season and particularly in winter, multiple red squirrels may share a drey to keep warm. Social organization is based on dominance hierarchies among and between sexes; although males are not necessarily dominant to females, the dominant animals tend to be larger and older than subordinate animals, and dominant males tend to have larger home ranges than subordinate males or females. No territories are maintained, and the feeding areas of individuals overlap considerably. Conservation status - The red squirrel is protected in most of Europe, as it is listed in Appendix III of the Bern Convention; it is also listed as Near Threatened on the IUCN Red List. Although not thought to be under any threat worldwide, it's population in the UK has drastically reduced in number with fewer than, it is thought, 140,000 individuals left, with approximately 85% of them in Scotland. This population decrease is often ascribed to the introduction of the grey squirrel from the USA, but the loss and fragmentation of its native woodland habitat has also played a role. In some areas of the world it is abundant and is hunted for its fur. However in the UK it is in decline, and in Jan 2006 the government announced a mass culling programme of the Grey Squirrel to help them recover. 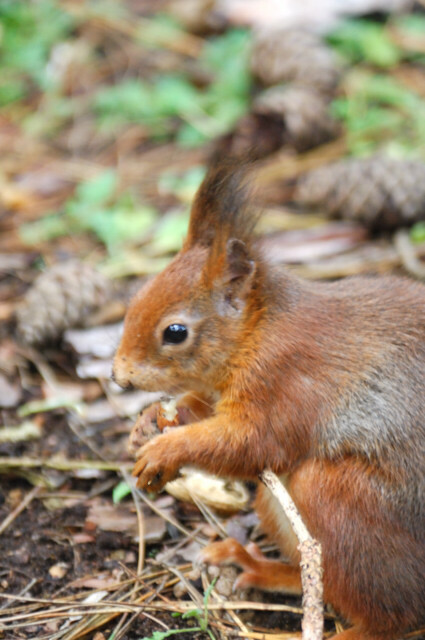 A cull in 1988 on Anglesey did result in a natural recover of the Red Squirrel population there and this was followed by successful reintroduction in to Newborough Forest on the south of the island. On the Isle of Wight, where there are about 3,500 on the island living mainly in broadleaved woodland. There are no greys on the island as the Solent provides a barrier to them getting across, although one does get across occasionally. They also have penalties and fines to stop people brining or releasing greys on the island. See here for a web link. In Cumbria, Northern Red Squirrels is an independent Red Squirrel Conservation group who bring a number of local Cumbrian groups under one umbrella. In Lancashire, The Lancashire Wildlife Trust looks after along the Sefton Coast which includes Formby Point. 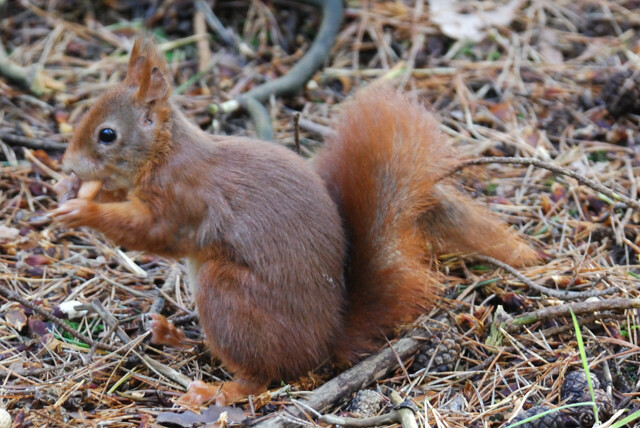 Newborough Forest, Anglesey is looked after by the Friends of the Anglesey Red Squirrels. Where the largest of population of Reds can be found in the UK and the following are some of the local conservation groups to help to monitor numbers. Red Squirrel Week 2nd to 9th October 2012.